Brighton artist John Whiting’s cityscape paintings fall broadly into two categories, the panoramic and the intimate. His Brighton seascapes show a fascination with manmade structures on the edge of wilderness, piers struggling to endure in rough seas, urban conurbations with open water beyond. His Brighton streetscapes show a concern for those busying themselves with everyday modern life in the city. He explains his work as attempting to convey an experience of place through the effect of light and movement. 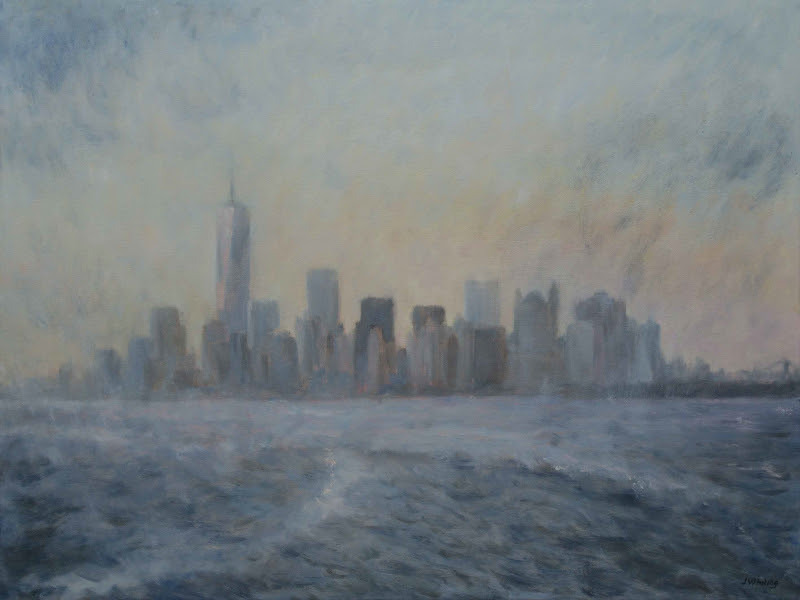 His new exhibition ‘Two Cities’ features a series of works resulting from recent visits to New York and a re-acquaintance with London where he lived in the 1980’s. NYC on the SIF depicts the New York skyline seen from the Staten Island Ferry, an everyday viewpoint taken for granted and hardly noticed by thousands of people on a daily basis. Having read Edward Rutherfurd’s story of New York John was taken by the notion that the first European explorers would have seen very little of Manhattan from here, just a low lying peninsular with a nomadic indigenous population. The scale of manmade development rising up from the flat sea and land is astounding. New York is a city where just about everything is happening and John’s streetscapes aim to capture some fleeting sense of this, based on memories, sketchbooks and photographs. London has changed a lot since John lived there in the 80’s, the streets are even busier and the skyline is a jumble of trophy architecture shouting for attention. In reacquainting with London John feels more like a visitor with a distant memory of belonging to the place than a local. He is drawn to the river where the city is open to the sun and the sky and you can admire it all from a safe distance. 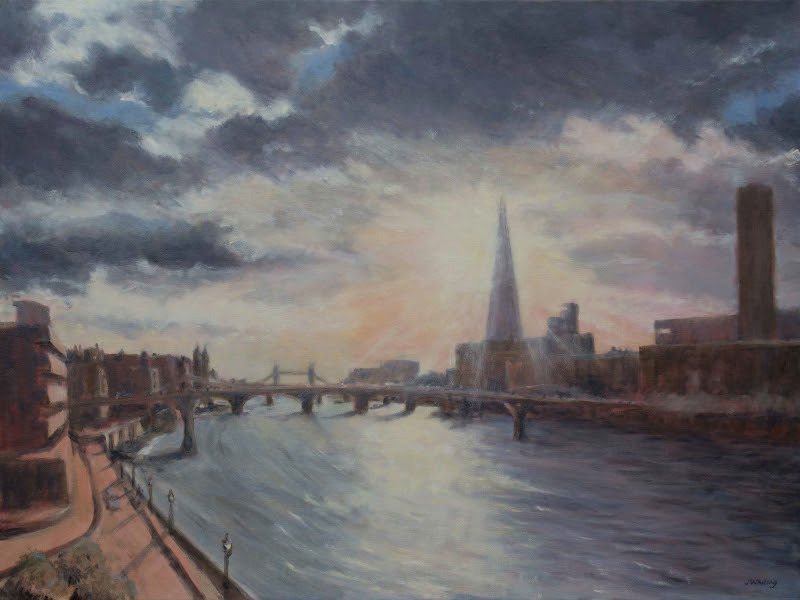 Blackfriars Morning is a sun and sky moment witnessed on one of his recent painting visits: The Shard splits the early sun’s rays as it lights the river surface and the city wakes up. As well as the work on display in the gallery, John’s adjacent studio will also be open to the public (Saturdays and Sundays only) showing his Brighton paintings and life drawings. This May 35 North also plays host to masters of brevity and wit Felstead and Waddell www.felsteadandwaddell.co.uk who will be performing their One Hundred Word stories on Saturdays throughout the Festival. Just drop in at any time between 12 noon and 4pm and demand your story! This entry was posted on May 5, 2015 by mptask in 35 North, Brighton, May 2015 and tagged 35 North Gallery, AOH 2015, art, art exhibition, Artists Open Houses 2015, brighton, Felstead and Waddell, John Whiting, painting exhibition.